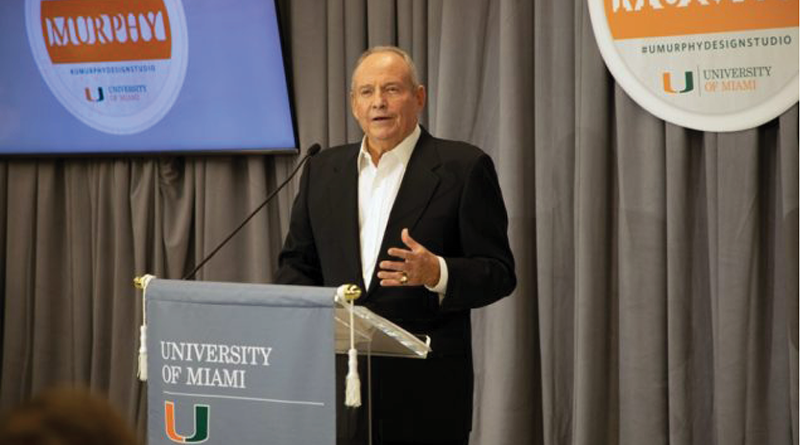 Miami-based Coastal Construction Group has announced that the University of Miami’s School of Architecture (U-SoA) celebrated the dedication of the Thomas P. Murphy Design Studio Building, a 20,000-square-foot state-of-the-art facility, on Nov. 29. The ceremony showcased the importance of providing an open environment for architecture students, where they can engage in collaborative learning and utilize a state-of-the-art fabrication lab. The celebration also honored the generous support of the donors that made the innovative scholarly hub possible — chiefly Tom Murphy Jr., Coastal’s founder, chair and CEO, who provided the lead donation for the facility. Designed by Arquitectonica and built by Coastal, the building was named by Murphy in memory of his father, Thomas P. Murphy, a painting contractor and builder in South Florida for more than 30 years. An Irish immigrant, Thomas P. Murphy grew up during the Great Depression and was part of The Greatest Generation. He earned a purple heart for his service in World War II as a paratrooper and “Screaming Eagle” in the 101st Airborne. Tom Murphy Jr. earned his contractor’s license at the age of 19, becoming the youngest contractor in state history, while attending the University of Miami. Shortly after earning his license, he took on the renovation of the fraternity house where he was living, and started his construction business. After selling his first construction company, he founded Coastal Construction in 1989 and has grown the company to become one of the largest general contractors in the Southeastern U.S. with more than $4 billion in active commercial and residential projects throughout the state.